German writer; born at Berlin June 19, 1771; died there March 7, 1833. Her home life was uncongenial, her father, a wealthy jeweler, being a strong-willed man and ruling his family despotically. She was very intimate with Dorothea and Henriette, daughters of Moses Mendelssohn. Together with them she knew Henriette Herz, with whom she later became most intimately associated, moving in the same intellectual sphere. Rahel's home became the meeting-place of men like Schlegel, Schelling, Steffens, Schack, Schleiermacher, Alexander and Wilhelm von Humboldt, Lamotte-Fouqué, Baron Brückmann, Ludwig Tieck, Jean Paul Richter, and F. von Gentz. During a visit to Carlsbad in 1795 she was introduced to Goethe, whom she again saw in 1815, at Frankfort-on-the-Main. After the death of her father in 1806 she lived successively in Paris, Frankfort-on-the-Main, Hamburg, Prague, and Dresden. This period was one of misfortune for Germany; Prussia was reduced to a small kingdom and her king was in exile. Secret societies were formed in every part of the country with the object of throwing off the tyranny of Napoleon; Rahel herself belonged to one of these societies. In 1814 she married, in Berlin, Karl August Varnhagen von Ense (b. Feb. 21, 1785, at Düsseldorf; d. at Berlin Oct. 10, 1858), after having been converted to Christianity. At the time of their marriage, Varnhagen, who had fought in the Austrian army against the French, belonged to the Prussian diplomatic corps, and their house at Vienna became the meeting-place of the Prussian delegates to the Vienna Congress. She accompanied her husband in 1815 to Vienna, and in 1816 to Carlsruhe, where he was Prussian representative. After 1819 she again lived in Berlin, where Varnhagen had taken up his residence after having been retired from his diplomatic position. Though not a productive writer herself, Rahel was the center of a circle of eminent writers, scholars, and artists in the Prussian capital. A few of her essays appeared in print in "Das Morgenblatt," "Das Schweizerische Museum," and "Der Gesellschafter," and in 1830 her "Denkblätter einer Berlinerin" was published in Berlin. 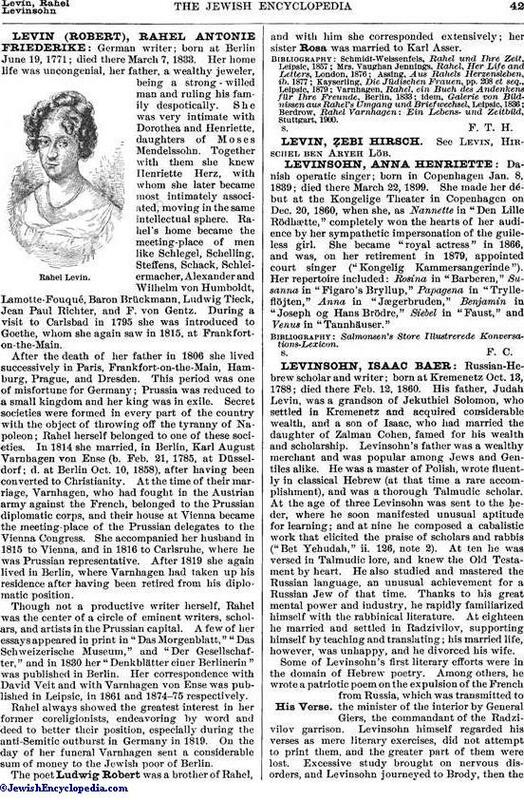 Her correspondence with David Veit and with Varnhagen von Ense was published in Leipsic, in 1861 and 1874-75 respectively. Rahel always showed the greatest interest in her former coreligionists, endeavoring by word and deed to better their position, especially during the anti-Semitic outburst in Germany in 1819. On the day of her funeral Varnhagen sent a considerable sum of money to the Jewish poor of Berlin. The poet Ludwig Robert was a brother of Rahel, and with him she corresponded extensively; her sister Rosa was married to Karl Asser. Berdrow, Rahel Varnhagen: Ein Lebens- und Zeitbild, Stuttgart, 1900.